When Beyoncé celebrated the word feminist on Sunday night, she was working against a history of celebrities and others rejecting the label feminist. Why do so many women, famous or not, reject the term, while seeming to support the basic principles of feminism? One possible reason is the way the word has been used in the media both traditional media venues and internet websites. Jessica Bennett asked me about the usage of the word, so in order to examine how feminist has been used by people producing television shows, radio broadcasts, magazines, newspapers, and websites, I looked at the collocates of the word feminist (including related form feminists) using two different corpora. The first is the Corpus of Contemporary American English (COCA), which includes a variety of different media from 1990 to 2012 (I restricted my analysis to radio, television, magazines, and newspapers). The second is the Corpus of Global Web-Based English (GloWbE), which includes websites from various countries (I restricted it to US websites). The results are presented in the tables below. The words in the tables are ranked according to the degree to which they tend to co-occur with the word feminist (or feminists). This means that each of these words shows a tendency to show up near (within 5 words to the left or the right) to feminist or feminists such that a sizable percentage of each word’s overall occurrences are near to feminist. 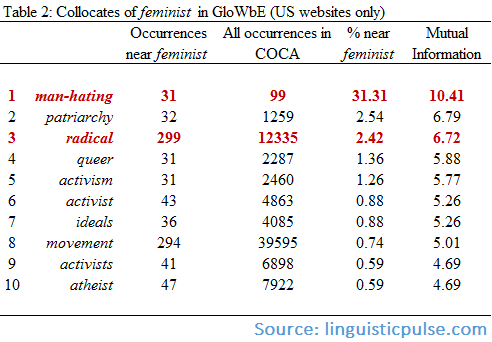 As a rather extreme example, about 31% of all occurrences of man-hating in GloWbE are within 5 words to the left or the right of feminist. This means that words like man-hating, radical, and militant reflect the way that producers of various types of media portray feminism and feminists. Since we often learn about the world through these people’s portrayal of it, many people have likely been influenced by these portrayals. At times feminists have applied these descriptors, particularly radical, to themselves, although even then such descriptors point to a general view of feminists and feminism as being on the fringe, making ‘unreasonable’ demands. It’s interesting to speculate whether the efforts of people like Beyoncé will have any noticeable effect on public discourse about feminism, specifically whether it will normalize it allowing people to see its political stances for the often rather mainstream, uncontroversial positions that they are. There is already an arguably more positive view of feminism circulating in public discourse especially reflected by words like scholars and activists. Hopefully, as more data becomes available, we’ll be able to see a shift in the way the public talks about feminists and feminism. i can’t seem to reproduce your results in COCA or GLOWBE? doh just noticed you searched for feministS as well. i see it now in Glowbe. I’m glad it came out this time! You scared me, haha. thanks Nic! any reason to choose 30 as a cutoff?